(Newser) – Zimbabwe's economy is in the tank, and recent flooding that stranded 60,000 hasn't helped. The country already has $11 billion in overdue loans, and it's not eligible for World Bank and IMF assistance to obtain a needed $20 million in disaster relief. China appears to have bailed on a rumored bailout. Yet somehow, President Robert Mugabe has found enough in taxpayer coffers to fund his daughter's $5 million wedding—not to mention a $5 million pair of North Korean-built statues of himself, as well as his own $1 million 90th birthday bash last month, the Christian Science Monitor reports. Ummm... wonder if Zimbaweans are counting the money spent by the rich 1% of the overwhelmingly white Congress of the United States? Who's counting the 5 billions spent in the Ukraine to topple the government, while denying veterans, the unemployed and food stamp recipients benefits? The 3.5 billion spent by the U.S. annually to arm and support their gatekeepers in Israel? The countless billions spent to manipulate, destabilize and run global interventions? Zimbabwe's leaders spending are a nano-sized in comparison to the corruption of the United States Empire, n'est pas? 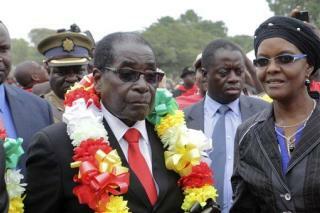 Props Mr. Mugabe for kicking out the thieves who stole the best land and are crying foul because you took it back. This criminal should have been assassinated 30 years ago. Where's the CIA when you actually need them?